Patient recruitment for clinical trials relies heavily on the mindset of those being sought out. 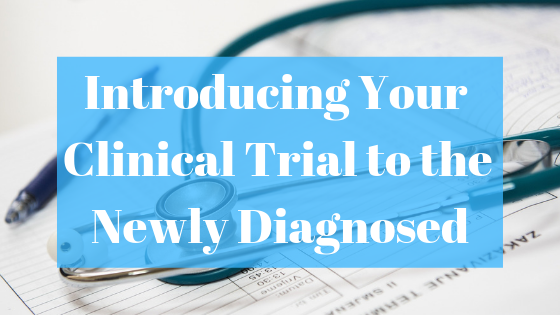 To give your trial the best shot at succeeding, it is crucial to try to understand the situation from the point of view of each patient demographic. Participation in a clinical trial depends on how a patient feels about their condition, their level of access to various treatments, and whether or not they are aware of clinical trials taking place. Your job is to understand the post-diagnosis journey and tailor your approach to meet patients in a common emotional space that conveys comfort. It is common for newly diagnosed patients to take to Google and begin marathon searches on the conditions they now live with. Data from recent studies show that roughly 81% of patients with a serious chronic condition use online resources to learn about medications or treatment options. Information found online is not only overwhelming but, coming from the wrong sources, can be incorrect or misleading. Providing straightforward facts with a clear plan of action will be welcomed by those in the whirlwind of a recent diagnosis. This is where paid search and SEO come into play as part of your digital recruitment strategy. Paid search usually refers to a pay-per-click marketing model in which advertisers pay only when people click their ad and visit their website. Google Ads, of course, is the heaviest hitter. SEO, search engine optimization, is a marketing discipline focused on growing visibility in organic (non-paid) search engine results to improve rankings, drive traffic, and increase awareness. Investing in paid search and SEO will increase your chances of getting your clinical trial in front of the eyes of the person searching for that particular condition. A new medical diagnosis inarguably brings up a range of different emotions and each patient will have a different reaction. Some may feel anxiety or fear, others may feel relieved or vindicated, and a certain number may experience a combination of each. It is crucial that you practice empathy in your outreach to the newly diagnosed. What you do not want is your messaging to come across as condescending or disingenuous at such a sensitive time in someone’s life. Patients dealing with a new diagnosis, regardless of the expected outcome, can experience a rollercoaster of emotions similar to that of grief or loss (anger, denial, sadness…). Showing that the staff and doctors of your trial will be a source of support will allow patients to unapologetically work through their emotions and be more comfortable in considering participation. It is crucial for newly diagnosed patients to know that they are not alone in their journey. If you want your audience to trust you enough to be open to recruitment, you need to make that message very clear. When developing a recruitment strategy to reach patients that have been recently diagnosed, put yourself in their shoes. What content and messaging will make them feel confident in their choice to participate in your trial? What can you do to quell their fears about the process? They need to know that there are options available to them and that there will be a system of support in place. Show them that you want to be a partner in their treatment.